Hi Folks! This is the BugDoc (Dave Shetlar) bringing you our first in a long series (hopefully!) of articles on iridescent stretch glass. Since Cal Hackeman was so welcomed during his week of stretch glass, Brian and Cal got together and hatched an idea to provide more information on carnival glass’s offshoot. Cal then asked several of us in the Stretch Glass Society to alternate with him so that we can all share our enthusiasm about collecting iridized glass. Most of you know about me (BugDoc Dave & Renee), and many of you will recognize the name of Russell Umbraco (and his wife Kitty). Russell and Kitty have collected carnival and stretch glass for years, first in California and now in Reno, Nevada. Kitty and Russell wrote one of the first books on iridescent stretch glass in 1972 (Iridescent Stretch Glass, Kitty & Russell Umbraco, Cembura & Avery Publishers, Berkeley, CA, 62pp)! This little book still shows up today on eBay and Amazon. Cal, Russell and I will alternate every Tuesday to present little nuggets of information on iridescent stretch glass. Since I drew the short straw, I’m leading off. Several of the glass companies that produced stretch glass were notorious about copying each other. If one company found something that sold well, another company would copy the design or form and try to cash in! 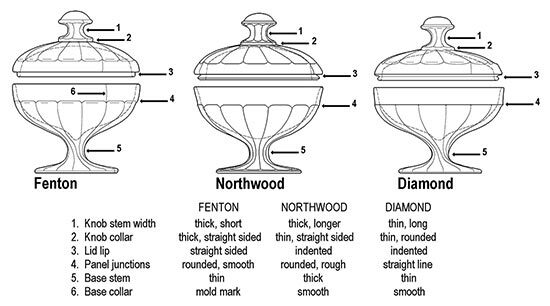 Tonight, I’m going to cover items that Fenton, Northwood and Diamond called covered bonbons. Each of these companies made identical forms, but there are tiny differences that can be used to identify the maker of each one. I’ve taken a picture of most of Fenton’s stretch glass bonbons (up in the header tonight.) Did you notice that two of the most common colors are missing? That’s right, I didn’t put in the Celeste blue or Topaz (Vaseline) examples! Stretch glass collectors have a tradition of using the names that the companies used, if we know them. In the grouping, the Fenton colors shown are (left to right, back to front): Tangerine (a yellow striking to orange); Royal Blue (dark cobalt blue), Wistaria (sic)(medium dark purple); Florentine Green (ice green); Velva Rose (pink), Persian Pearl (crystal) and Grecian Gold (marigold). Northwood made the same covered bonbon in their colors: Blue, Topaz, Russet (a unique yellow-olive-green), Jade Blue (a unique robin’s egg blue opaque glass), Ivory (opaque light butter-yellow), and a single opaque white bonbon piece is known. Diamond made theirs in Blue (they also used Harding Blue as a name), Green and Topaz, but they also made them in unique colors: Egyptian Lustre (black glass with multicolored iridescence), Blue Crackle (cobalt blue with actual crackle-glass effect), and the only stretch-iridized red bonbon known is from Diamond! So, how do you tell them apart? I’m including a drawing to illustrate the differences. If you have the lids (be careful, as folks have married the wrong lids to bottoms! ), the Fenton lid has a straight lip that fits into the base. Northwood and Diamond use a lip with a ridge on it. If you only have the bottoms, then look at the wide band at the top rim. Fenton and Northwood’s will have scallops where the panels meet this band, but Diamond has a straight line at this junction. 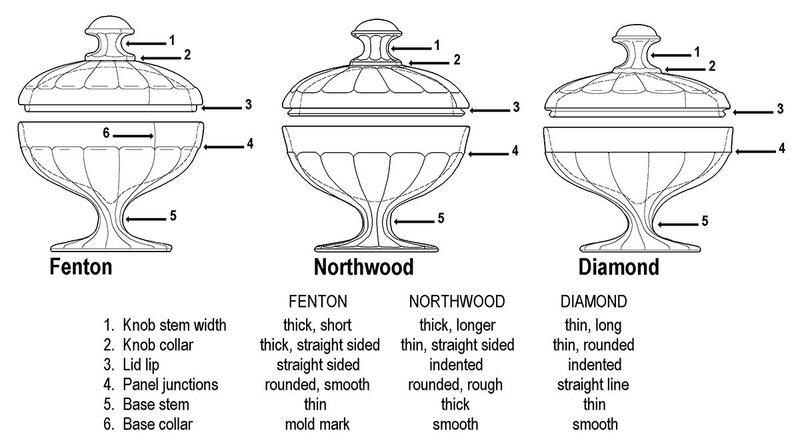 Fenton’s has a mold seam that visually crosses the band (in three places), while Northwood’s doesn’t have the mold seams visible. There are other features that are shown in the drawing. Click the picture above for a larger version. In summary, for those who like to get one of each, by my count, there should be 22 to 23 potential colors and companies! There are even more possibilities because many of these bonbons may be decorated with gold, enamel, or cuttings! Happy hunting! !